Have you ever gone down to do the splits and not be able to get yourself back up without help? Well, trees with structural deficiencies can actually split in a similar manner. Two arms of a trunk may stretch wide during a wind event, but they can't pull themselves back together afterward. The typical split we see is like this one below, with the drill and drill bit through the trunk. To fix a splitting tree, we apply structural support in the form of cabling or bracing. This hackberry split about 7' up from the ground and we are drilling two holes through the trunk so we can install threaded rods to hold the split together. It's not an easy task. In the above photo, we are using a 4' long drill bit and a drill that weighs around 15 pounds. The hardest part is when the drill bit gets completely stuck in the tree! Its happens too often and can be a scary moment. This is what it looks after the rod has been installed and tightened. Notice that the crack has closed! That is not always the result, but is pretty satisfying when it does happen. Here is a good profile shot of the two rods with the washers and nuts on the end. One of the braces goes through near the top of the split and the other is installed around 20" above the lower brace. The braces are around 30-35" long from end to end. The rods are cut as close to the trunk as possible and then the ends are pounded with a hammer to prevent the nut from backing off. Side view of the two braces after installation. 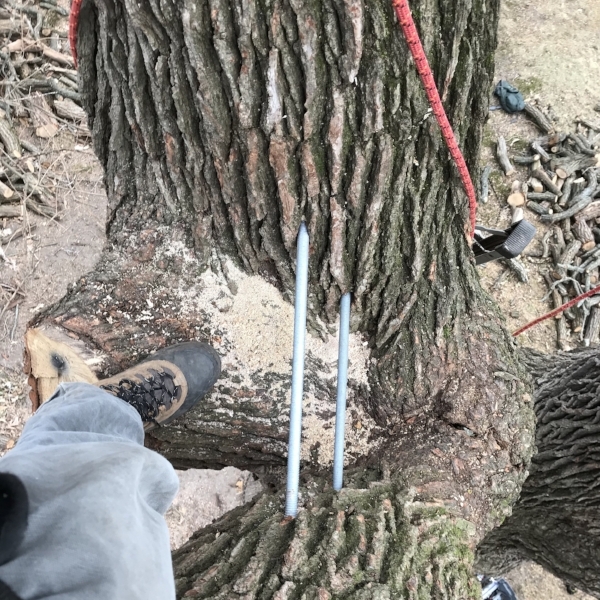 In most normal tree repairs to a split trunk, the work does not stop at the brace. The top of the tree is where all the leverage happens, and it also requires support in the form of a static steel cable. This cable helps to hold the tree crown together, reducing the forces being placed on the brace, and helps to hold the tree together. Static steel cable to hold the top together and reduce forces being placed on the truck on the tree. The last picture shows a detail of a brace in a different tree, viewed from above. This brace is about 6 feet long and required lots of effort from many people to get installed. It was well worth it, for this tree a heritage burr oak on Lakeside in Madison. A truly incredible specimen, the back side of this tree was split and had been split for some time. We had to install two cables to hold the top together and then put two super long braces through the trunks. Each time we do a brace there is a challenge that pops up. These challenges probably explain why this is an underutilized application. Cutting the branch off is usually easier, but often is not what is best for the tree. 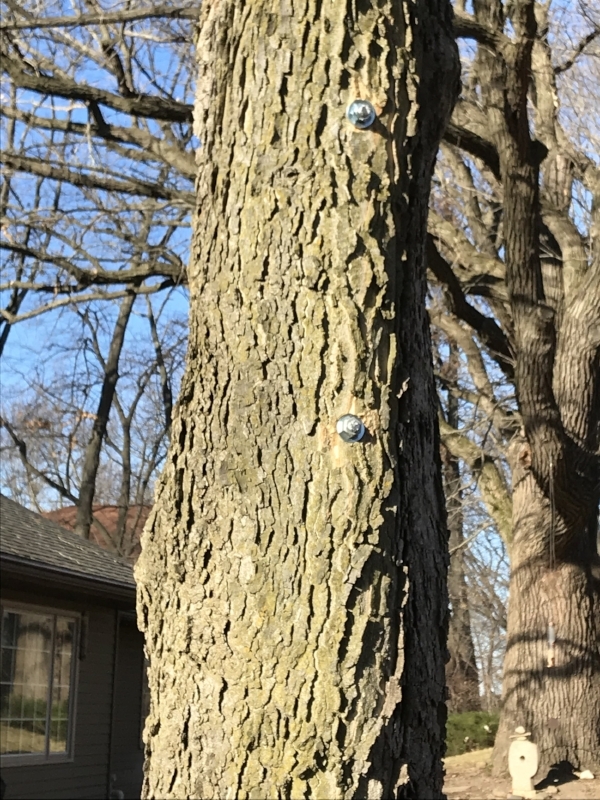 In both the above trees, there was no decay present so the bolts and cables replaced the wood that is supposed to hold the trunks together. The combination of bracing and cabling can stabilize a split tree and be an alternative to tree removal. Unlike the braces on a teenager, tree braces and cables are permanent! This is Big Bertha the fir tree. She lives south of Mt Horeb and was named by a tree loving 7-year-old. The mother of the boy called us and asked if we could stitch it back up after a summer storm. 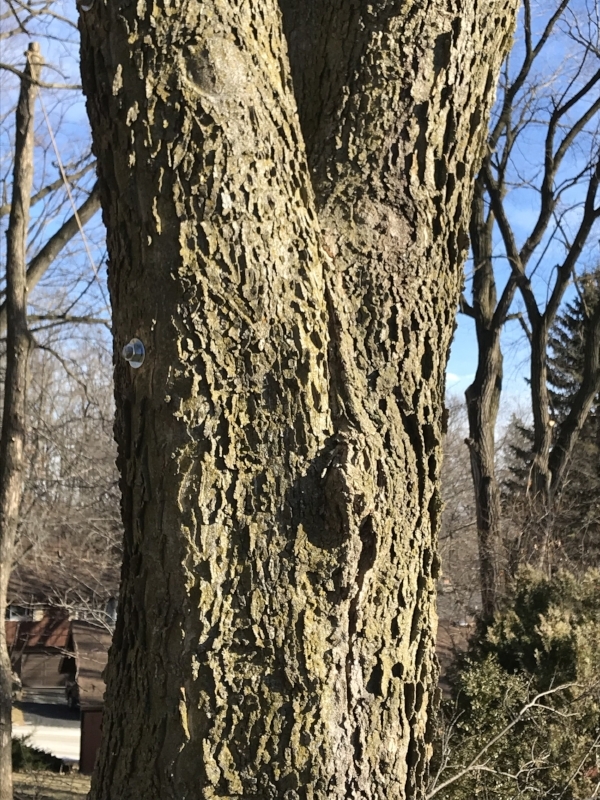 The possibility of cutting it down due to the split between the two halves was too much for the boy to manage and he pleaded with mom to call us. The friendly guy at the bottom of the photo is Alex; he is standing in front of his handy work. He cleaned up the failed branch (see cut on trunk) and then took it upon himself to install the dynamic cables; you can see two cables there, installed as high as possible. These cables are more effective the higher up you put them in the tree. Cables have a tensile strength of over 10,000 pounds making them very strong. The best feature of the support system is its stretch which allows the tree to move freely compared to rigid static steel cables. The other nice attribute of dynamic cables is there is no hardware installed or drilled into the tree. A simple knot is tied around the branch with room for future growth. The one drawback to the dynamic cable is its lifespan. These cables need to be inspected every couple of years and replaced after 5-10 years due to potential wear and degradation over time. When compared to static cables the dynamic is a bit less expensive in the short term, but in the long run they would likely work out to be the same amount of investment depending on how long the tree remains on the property. 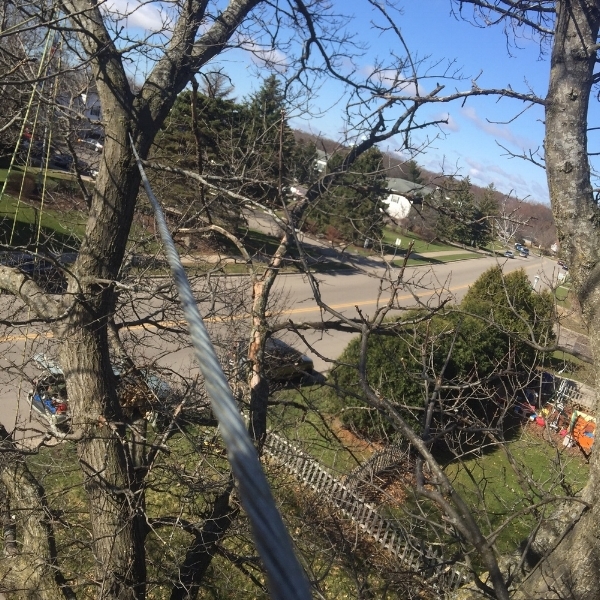 Over the years, dynamic cabling has allowed us to prune suspect branches aggressively to reduce risk and then install the cable to provide a bit more insurance against branch failure. This is a tool that can help keep trees safely in the landscape longer. Long live Big Bertha! Every year, we "straighten up" quite a few trees for various reasons. Trees typically start leaning due to a high wind event, sometimes combined with heavy rains and wet soil. A leaning tree isn't necessarily unhealthy (it really depends on the root condition), but they do look funny in the context of a manicured suburban landscape. This learning spruce tree below made a great case study on straightening tipping trees. This tree took the cake in terms of size for leaning trees straightened by Heartwood in 2016. 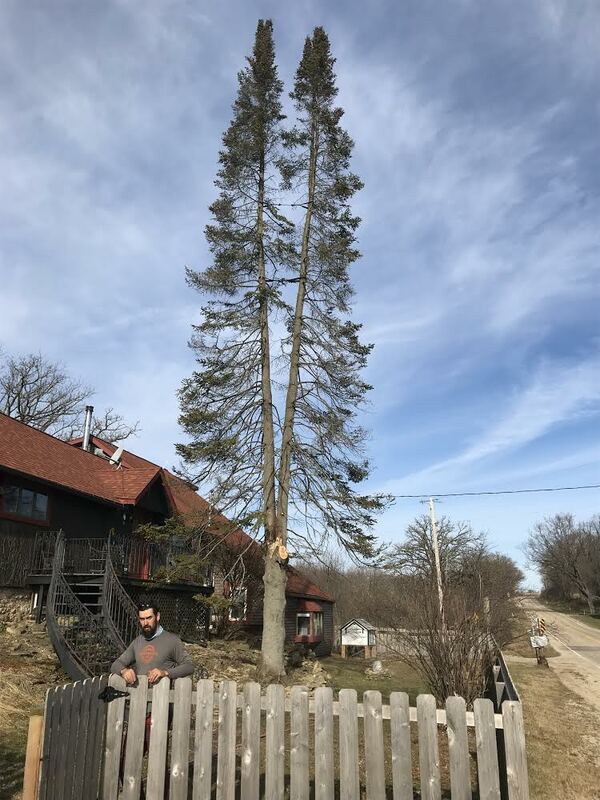 This guy was 25-30’ tall, and as you can see it was tipping/leaning a lot. The wet weather in spring (which loosens soil and destabilizes roots systems), combined with strong winds later in the year (which levers trees strongly and pulls on their roots), proved too much for many shallow-rooted spruce trees like this one. A leaning tree can be saved depending on the severity of the lean and the condition of the tree. Often if the roots are exposed or the lean is too great, there is little that can be done to save a tree. This customer really wanted to save the tree, so we gave it a shot. As far as we know the tree is still healthy! The uprighting process is not too complicated, as you can see in the second photo. We rigged one rope through a pulley, attached one end to the spruce, attached the other to the poplar, and set up a 5:1 mechanical advantage system. The 5-to-1 is the short yellow rope above the drooping orange line. The mechanical advantage helps create super-human strength to pull the tree up straight, multiplying the force of the person hauling on the line roughly 5 times (though we lose some energy to the friction of the ropes through the pulleys and hardware). Once straight, we install three poly cables (ropes) to hold the tree in place. In this case, two cables went to posts pounded into the ground to help provide stability on each side. The other cable was attached to the poplar trunk, which is the main support for the spruce. The biggest concern with leaning trees is whether the roots are healthy and strong enough to attempt to straighten the tree. In this case, the roots were still intact and buried. Beyond the roots, the next concern is what to tether the tree to. In this case we had a sturdy tree that provided me confidence that this could be done. If we had to hold this tree up with only three metal posts, we may have reconsidered our options. Once the tree is straight expect to leave the cables in for several years at a minimum, especially with a tree of this size. Each tree is unique so there is really no good way to know how long the tree might need support. Over time the cables will just need to be checked for proper tension. 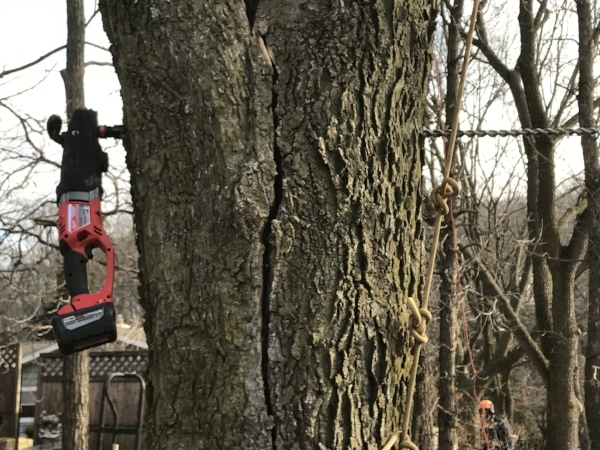 When checking the tension, you can always let out the cable a bit and see what happens; if the tree does not move at all when the cables are loosened, it may have reestablished enough root system to stand straight on its own. I wish there was a more exact science to this but there really is not! We had many successes righting many "ships" last year, but we also had some failures. In any case, we forge on willing to straighten just about any tree out there if the owner wants to give it a shot. I mention this because tree straightening is not always successful, but why not try it if it’s a safe option?